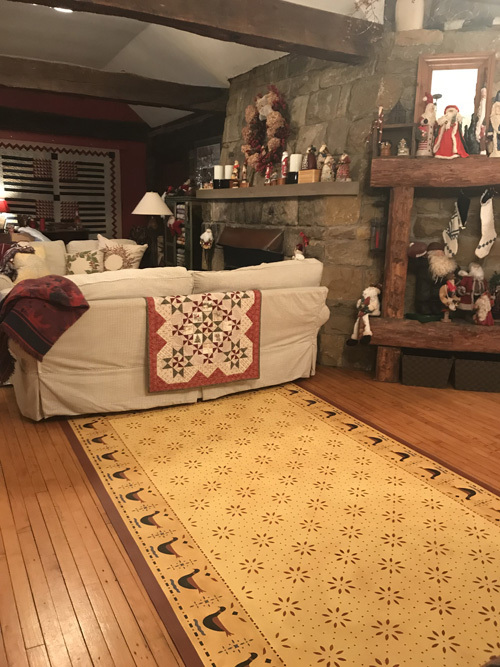 We would like to thank all of our valued customers who have taken the time for their testimonials and sharing beautiful pictures of floorcloths. Thanks so much for everything. 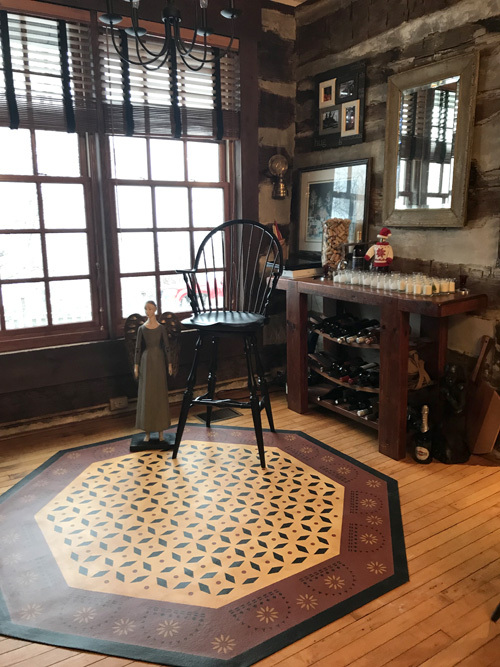 I would imagine you will be hearing from us again in the future, as we plan to add more floorcloths to the museum as soon as we get the funds to do it, and we were very satisfied will all aspects of your service and with the finished product. 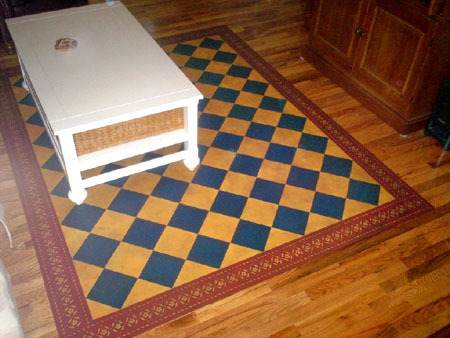 Hope you like these photos as much as we love your floor cloth! This looks beautiful, Neelam. Thank you for your insight, design and talent! You have allowed us to have just what we want! The floorcloths are exactly what we wanted! 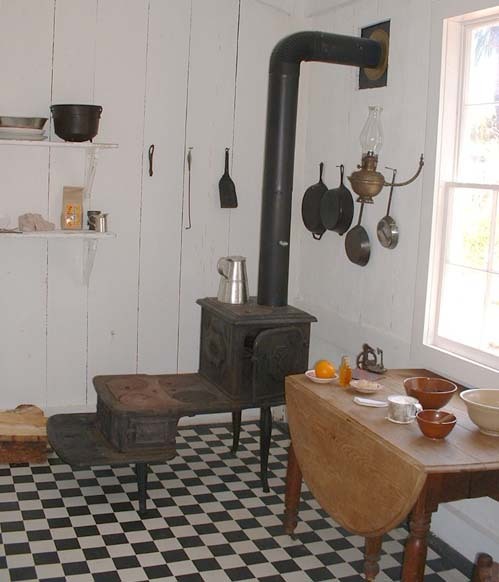 Perfect for our 1700’s Log house! Many thanks!! 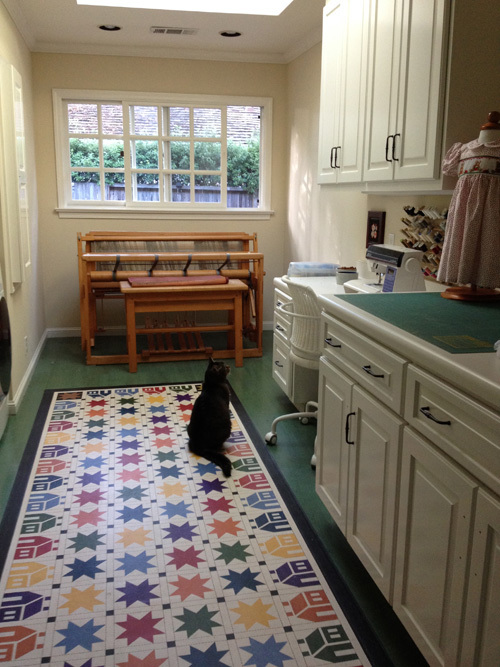 I've been waiting for the cabinet doors to be installed, and now that the room is finished I wanted to send you a photo of our beautiful floorcloth installed in our craft and laundry room. 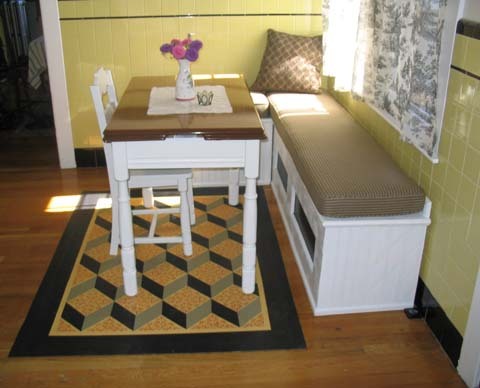 It is stunning and just perfect for the space and the room's use. In time I will probably hang some of my smaller quilts on the walls, but for now this is what it all looks like. And as you can see, our cat is quite at home there, too. I really appreciated the careful packaging and detailed directions. We will enjoy your beautiful work - and take good care of it - for many years to come. 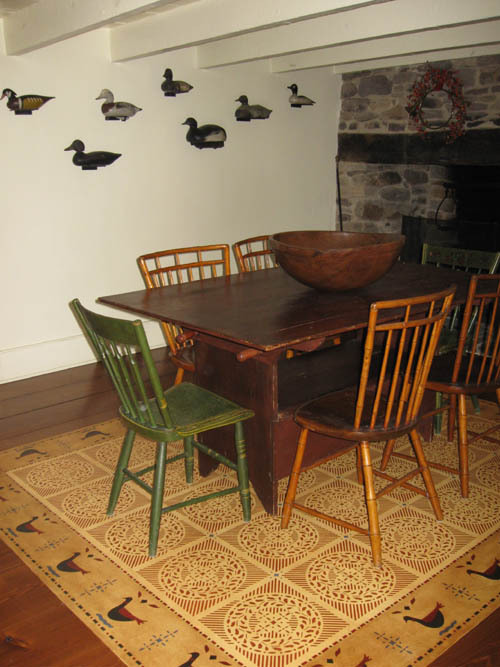 Our floorcloth has settled into place and is truly lovely. 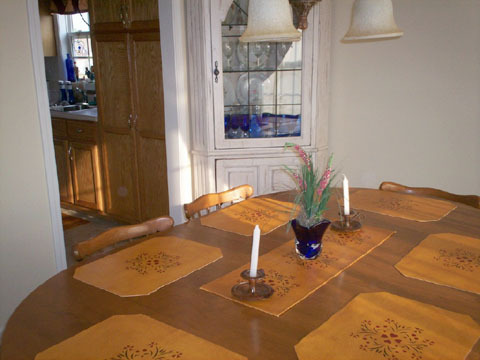 It is certainly a conversation piece that compliments the room well. 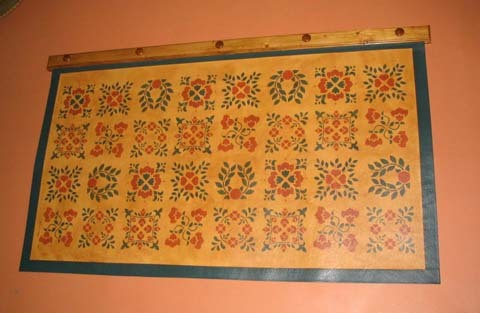 The May House motif is replicated in a turn of the century (1900) stained glass piece that hangs above the buffet. 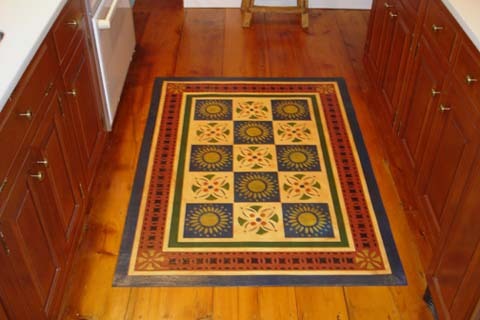 We hope to enjoy the floorcloth for years to come. 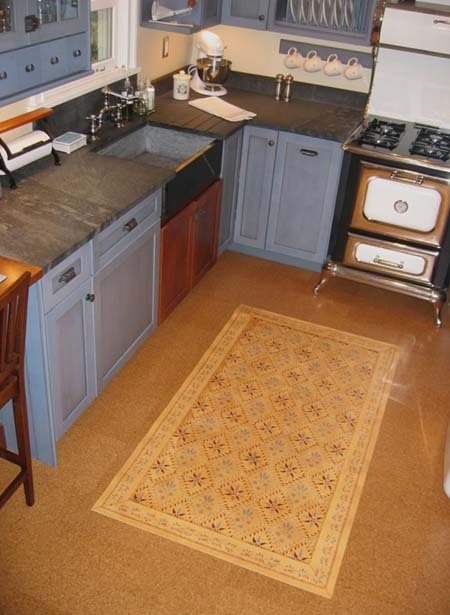 Neelam, The floorcloth is beautiful and looks great in my kitchen. Thank you!! 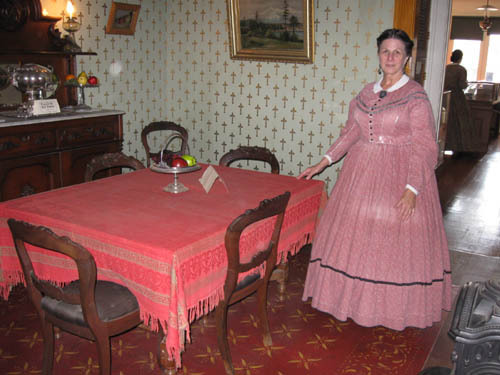 Neelam, As you can see it looks great, and so "period" with my tavern table. I love it! 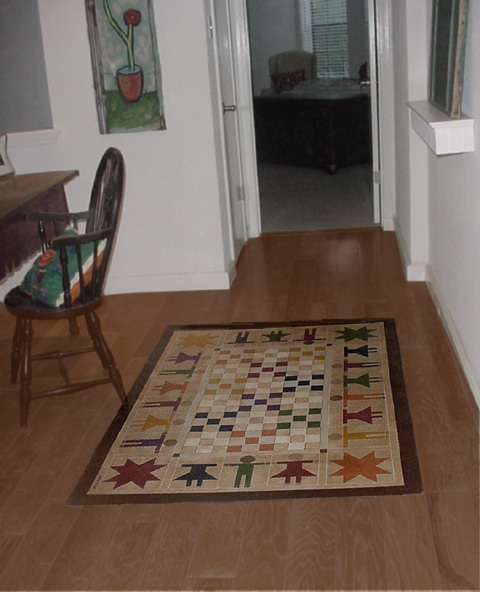 My floorcloth arrived last week and it is GORGEOUS! Thank you so much. Maybe I'll be able to send some business your way. I know people will ask where it came from. I received my Floor Cloth yesterday and set it up today. 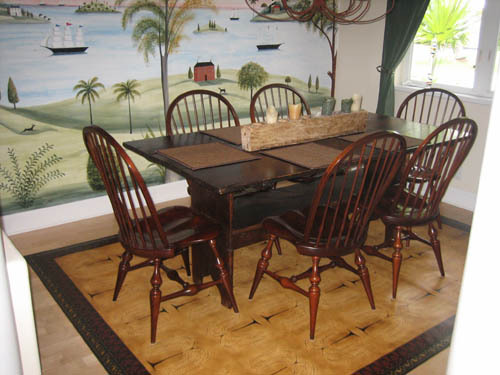 It is beautiful and goes great in my Dining Room. My husband said "It's a shame to cover it with the table". Thanks Neelam. I'll be back again for more. 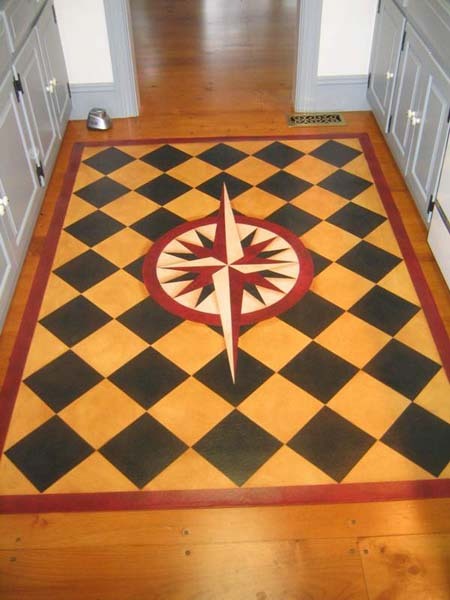 We LOVE the floorcloth--it has gotten so many compliments, and I am always sure to give them your website. We are so very happy with it. Hope you can still use these! They have arrived, warmed, unrolled and put into place. Beautiful! My practically perfect dog is the model. Thanks a million. 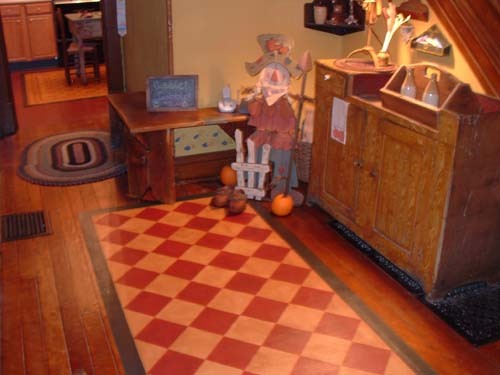 I will think of this fun process and meeting you as we have many years with the floorcloths as part of our home. Thank you so very much. 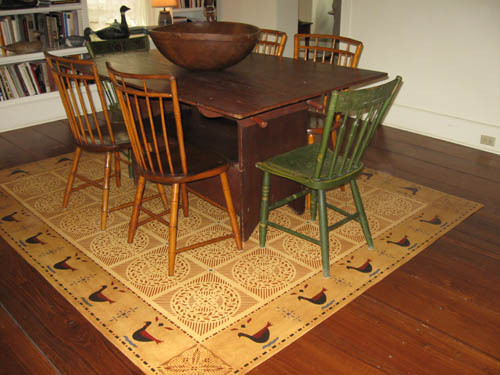 The floor cloth is beautiful and complements the room as nothing else ever could. 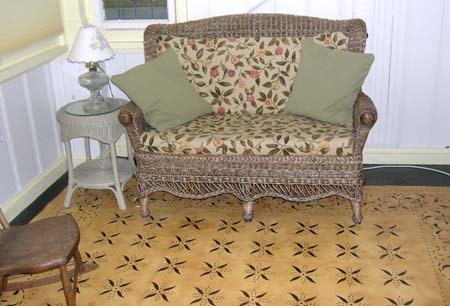 It was a good choice for our old farmhouse; much better than the rugs we had used in the past. 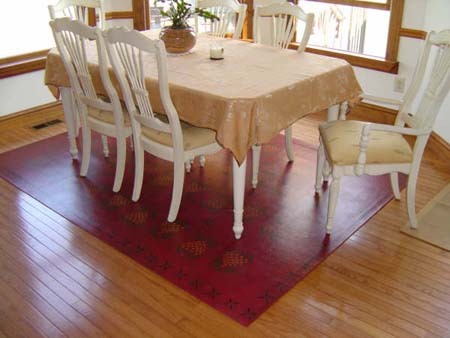 The floorcloth exceeded our expectations by a mile! Your work is excellent. I received the floorcloths and they are beautiful. Thank you again so much for putting your talent to work for us making this fine piece of art. We are enjoying it immensely. It has been a pleasure working with you! 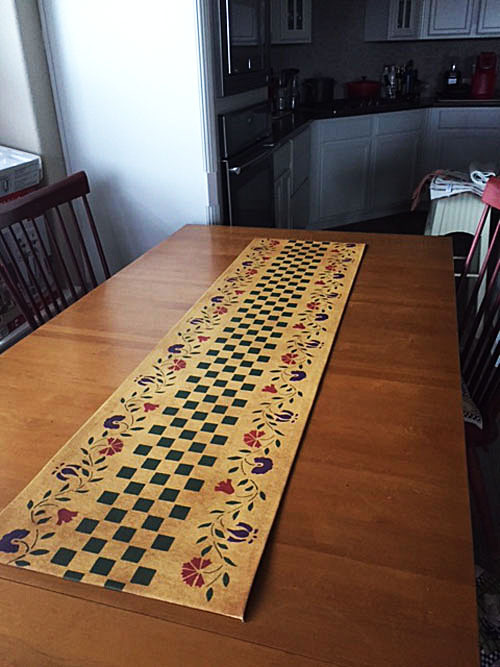 I received my beautiful floorcloth yesterday and just took it out of the box this morning. Thank you so much. You are a very gifted artist. Happy New Year! Thank you for the photos. 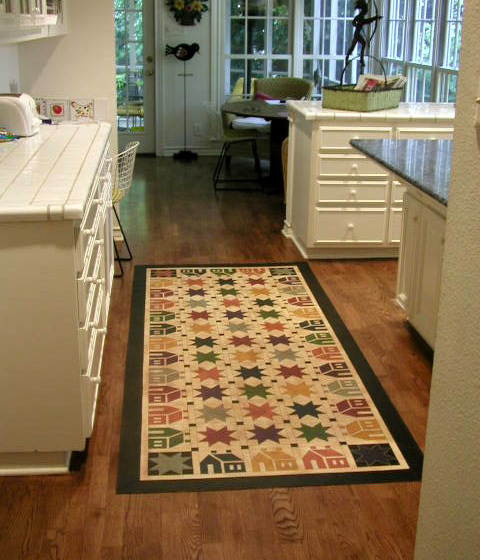 We love the floorcloth. Jay was happy with the quality of the work and how great it looks in the room. Thank you again. 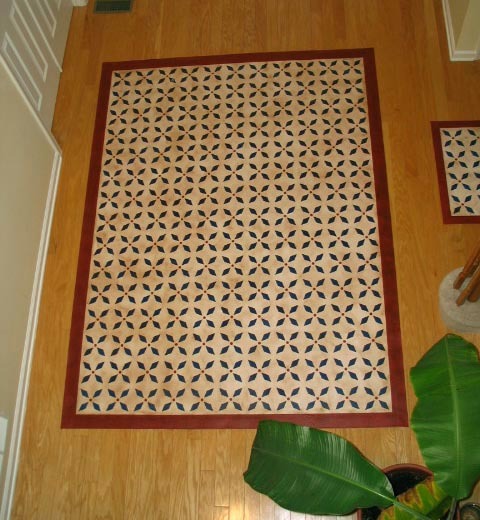 Customer Comments: We love the floorcloth. It's the finishing touch we needed. 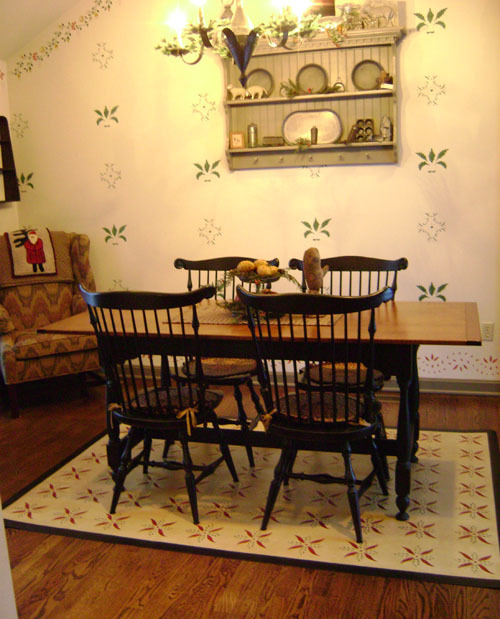 Our dining room is not a formal dining room. It's where my husband and I and the kids have our meals. It's cozy and we enjoy it. Even better now! Thanks again for everything! 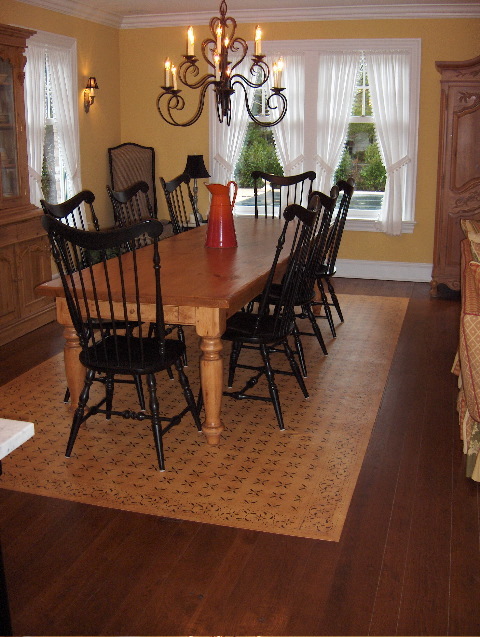 We just received and unpacked the floorcloth. It's beautiful!!!!!! 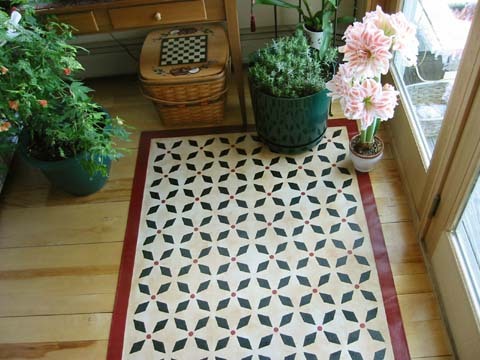 I am going tomorrow to purchase the rug gripper. It's laying very flat already. 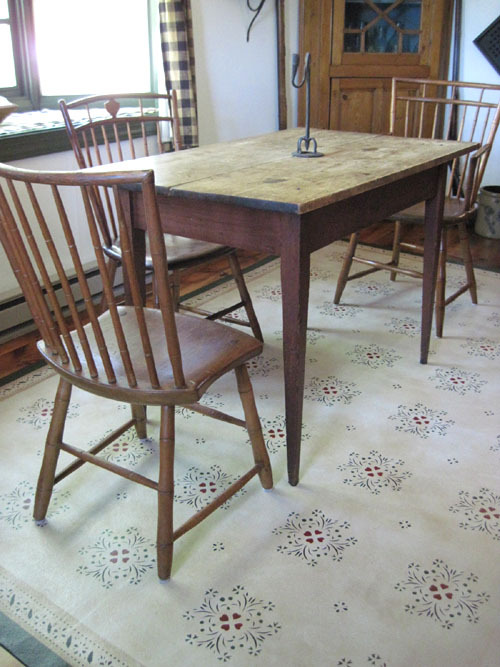 Hope to have it in the dining room tomorrow evening! 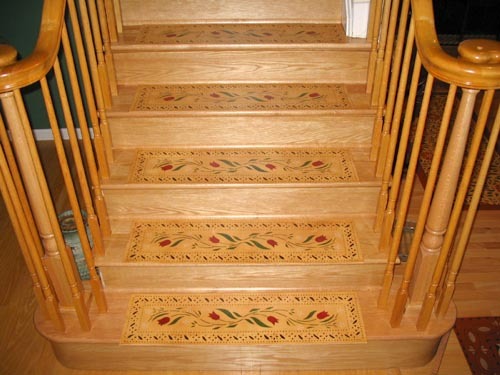 The runners are an elegant accent to the stairs. They used to look so plain but now they are the highlight of our foyer. 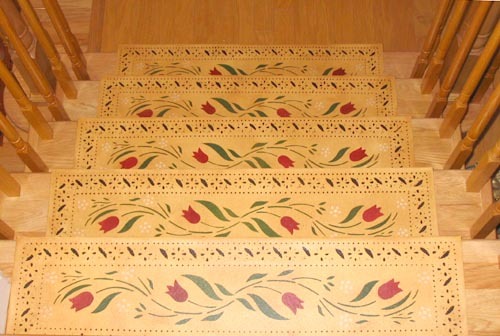 The runners also provide nice cushioning when climbing the stairs! 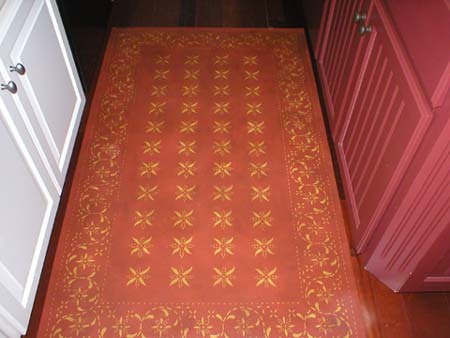 Neelam, The floorcloth just arrived! We took it out of the packaging and peeked at it -- it's beautiful! We'll unroll it tomorrow. 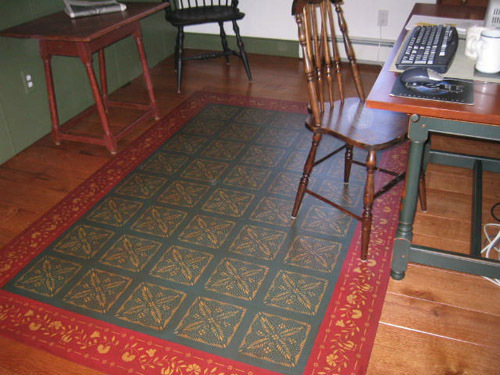 Here's how the floorcloth looks in our office. We love it! Thank you so much for your artistic creativity and your professionalism. 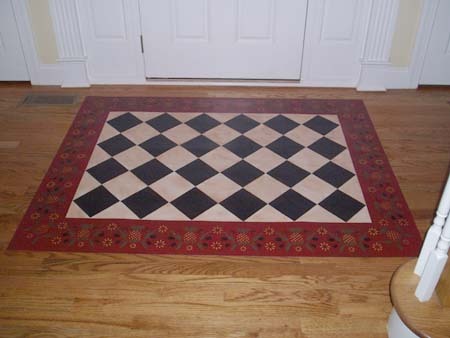 Thank you so much for the beautiful floor cloth. 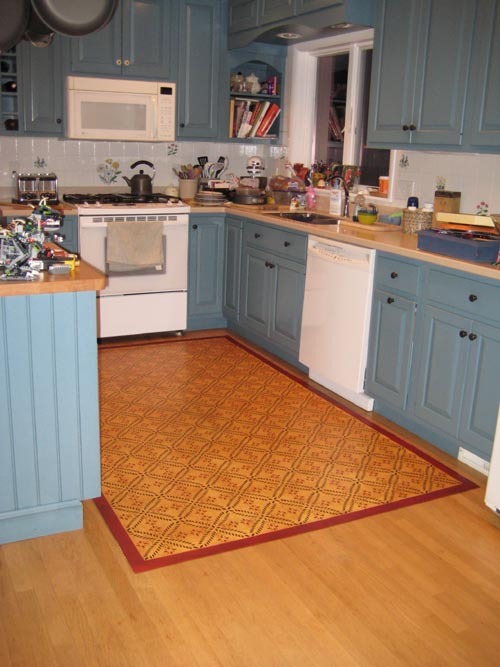 We have finally cleaned up the kitchen and installed it today, I am so excited. It looks and feels wonderful. I hope to be able to purchase more for the rest of the house in the future. Thanks again! It is more beautiful than I expected. 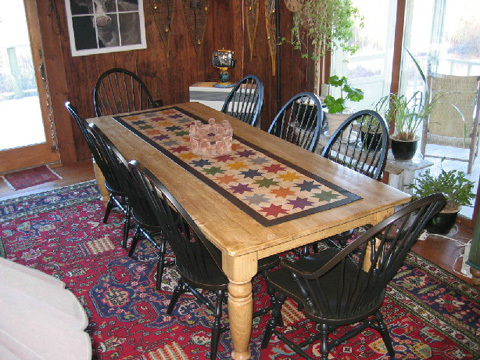 Please see pictures of how it looks on the table. Thank you so much and I will be back in touch for additional floorcloths. Also, my sister is interested in one. It arrived yesterday and I rolled it out this morning, stunning! The manner in which it was wrapped and shipped was excellent. Thank you so much. 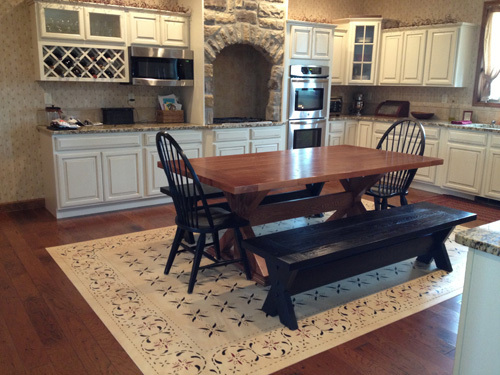 Size: 26" x 10' ( 30"x 120") , 30" x 54"
The Floorcloths are exquisite! 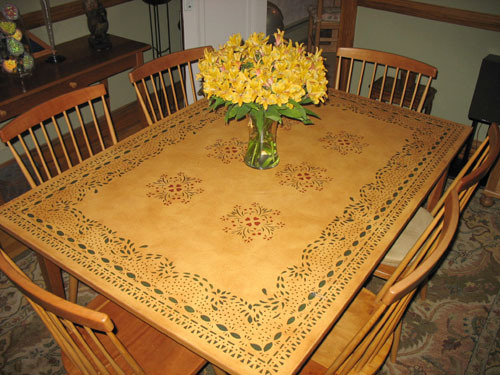 Even viewing them online during the stenciling and painting process did not prepare me for their elegance and artistic perfection “in person;” they literally took my breath away. 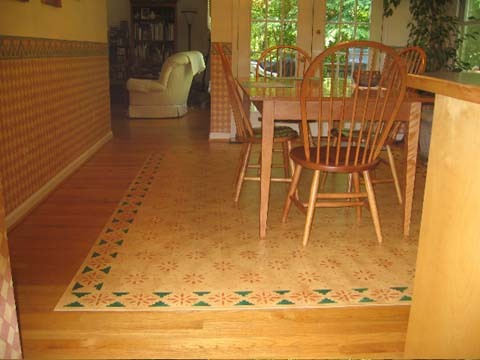 The floorcloths look wonderful in my home, and I thank you for making them, and for all the help you gave me every step of the way. My husband and I love them (so does my daughter, who is hard to please!) Thank you! I hope I can contact you when I am next in NJ; I would love to meet you. I got the floorcloths tonight and I can't believe again, how beautiful they are. I am so very pleased with my floorcloths. I want to get one for my dining room as soon as I can. 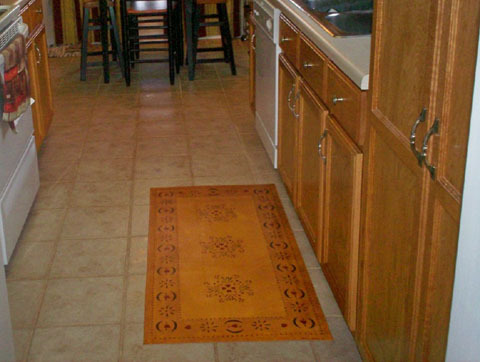 I have made floorcloths so I know how much work is involved, plus mine don't turn out like these. The attention to detail is amazing and you worked with me to help decide colors. Even my husband likes them and he is hard to please. WOW! 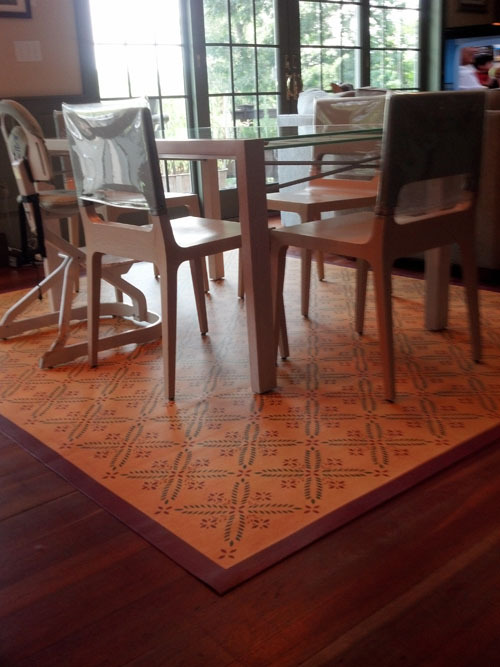 We just received our new floorcloth, and I wanted to tell you that it is wonderful! 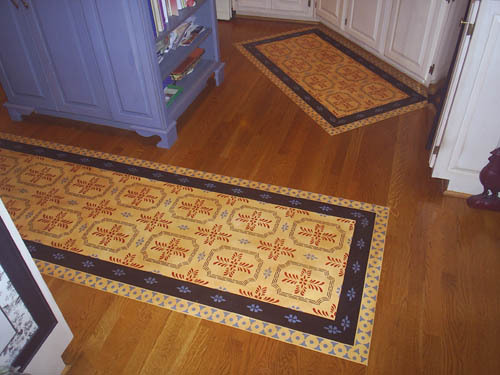 We have somewhat of a collection of floorcloths, and wanted you to know that yours is the best quality workmanship by far. It is just beautiful, and just right in our primitive home. I would definitely recommend you and your beautiful work to anyone. Thanks for the great customer service, and for the great addition to our home! The floorcloth arrived last night and it's beautiful! 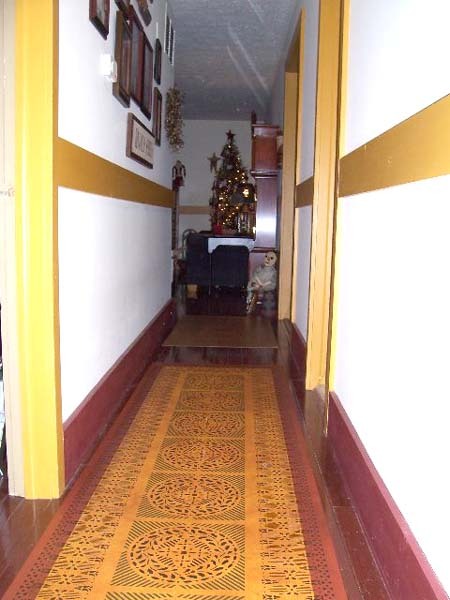 It fits perfectly in my entry way foyer and the colors are wonderful. I just love how it looks - thank you again for such a beautiful job. We received it Friday. It looks great, just as we expected. Thanks!!! The floor-cloths arrived as promised on Friday afternoon, my husband was already home when they arrived, so they spent no time outdoors. I'm very impressed with the care you took with the packing of the floor-cloths, I don't think anything could have harmed them. I didn't have a chance to put them down until today, Sunday, and they both look beautiful. If you would like I'll send your a picture of both of them in their new home. Thank you again for doing such a wonderful job, and all your help with the color selections. 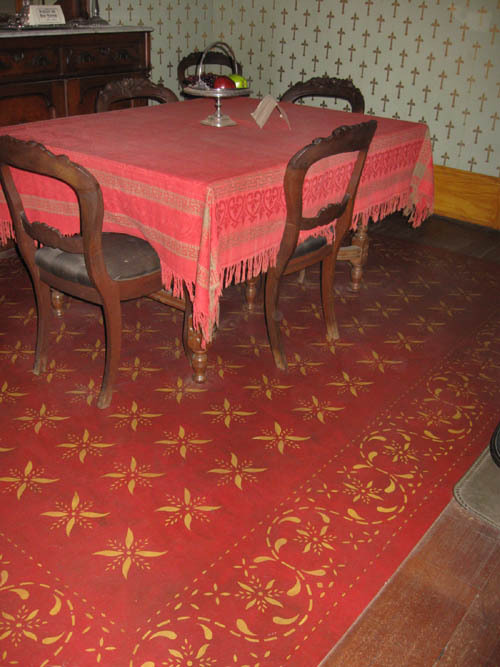 We loved the pineapple floorcloth. 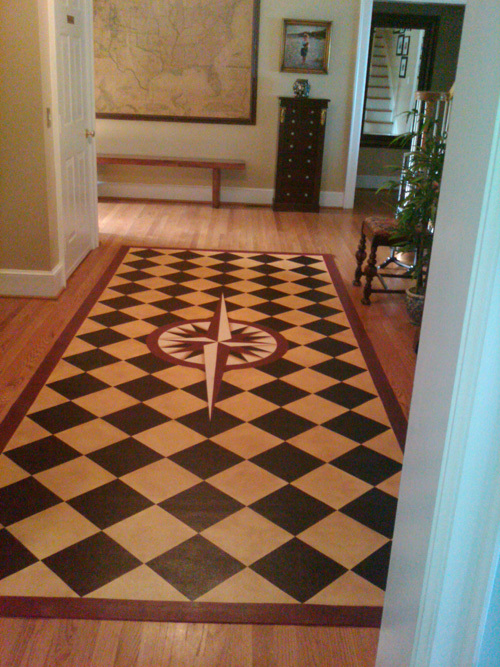 It looks great in the foyer of our Colonial style home. It is perfect and exactly what we wanted. Thanks for all of your time and talent in creating such a beautiful addition to our new home. We have gotten lots of complements on it. Absolutely superb quality! 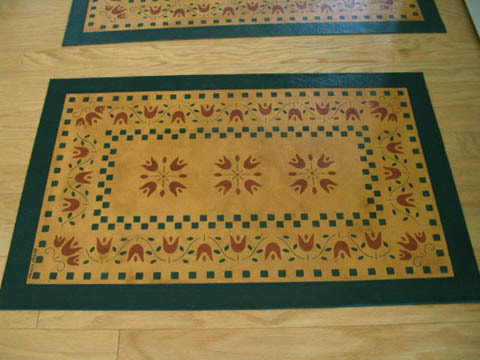 Workmanship is exquisite, color combination beautiful! It is absolutely gorgeous! Thank you so much for the beautiful addition to our home. You have been wonderful to work with and I look forward to ordering another cloth in the future. 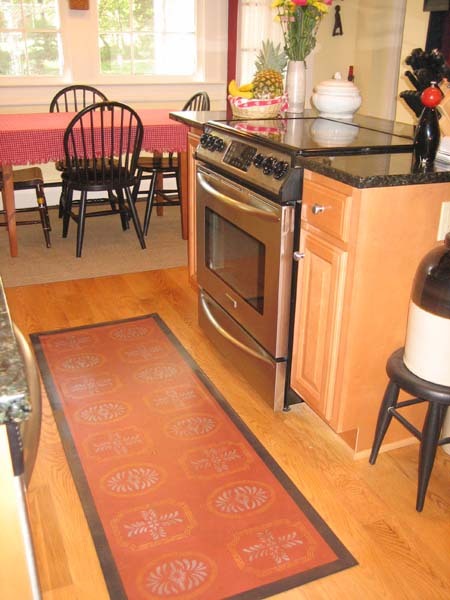 I will highly recommend you to everyone who admires our new floorcloth. 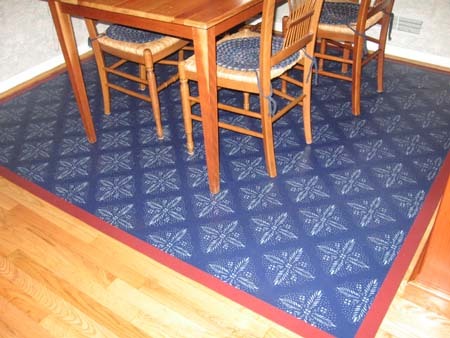 Customer Comments: Just wanted to let you know that we got the floor cloth last night, and we love it!!! It is in fine shape, and has flattened out wonderfully. Thank you so very much for your artistry and skill. 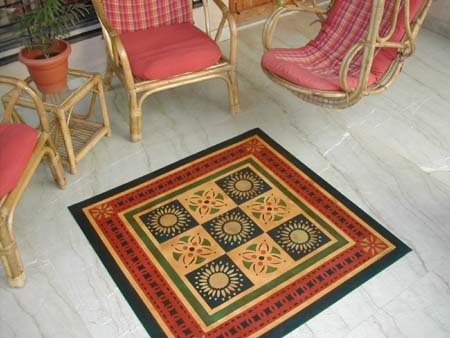 We will unhesitatingly call on you again for our next floor cloth!!! 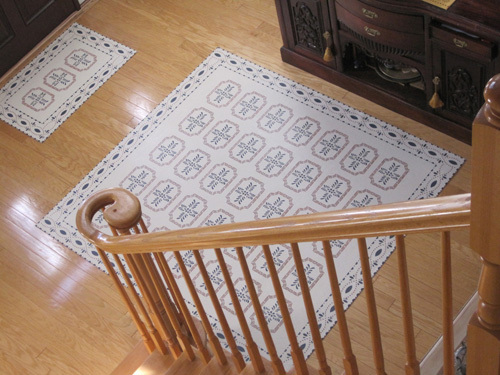 We love the floorcloth and as you can see it fits right in. "Wow! We're really impressed! 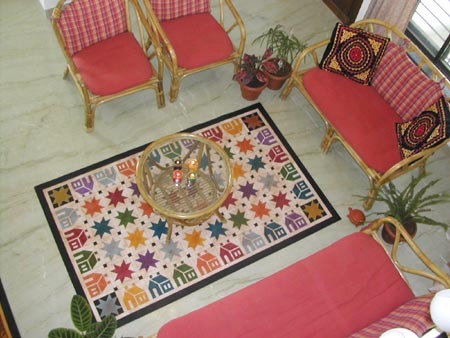 You're possibly the first to bring floorcloths to India and with art pieces like these this it certainly won't be the last we see of Design Village floorcloths! Great job, wonderful finish!" I received the floor cloth today and it is beautiful. Thank you so much for your hard work. We have unwrapped it and are delighted. It is beautiful. Many Many Thanks! 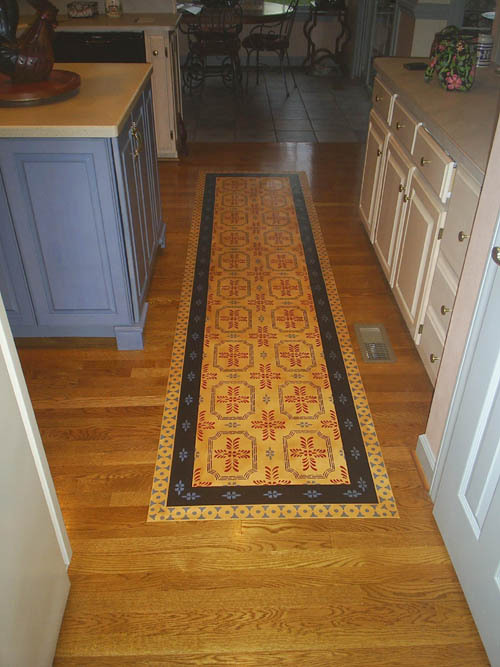 Everyone that sees the floorcloth loves it. I've sent photo's all over the USA. Many many thanks again for a beautiful addition to my kitchen. 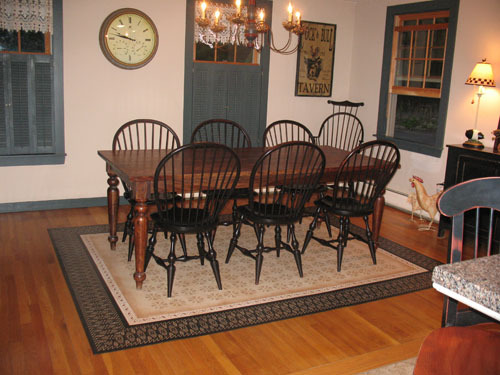 Size: 3' X 5' (36"X60"
We got our floorcloth, unrolled it in the dining room, and it is quite splendid. 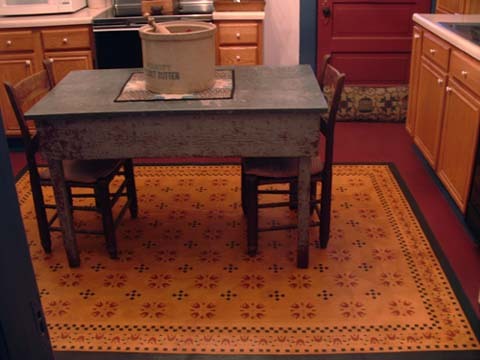 I am absolutely delighted with the floorcloth. It is just great, and I can't wait to install it in my home in New Hope. Everyone here at the lab got to see it today, and were duly impressed. The packaging was superb. Needless to say, I am happy as can be with it. It is absolutely beautiful. You do amazing work of art!! You made me very happy… Thank you very much for your truly fine work of art. 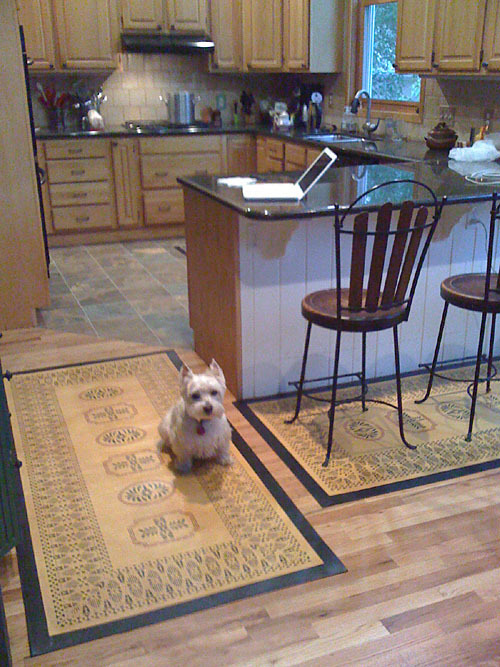 Floorcloths arrived safe and sound and look wonderful! I received the floorcloths and I LOVE THEM!!! You do really nice work, with detailing that sets your cloths above the rest I have seen. My cats have had a very funny reaction to the floorcloths. 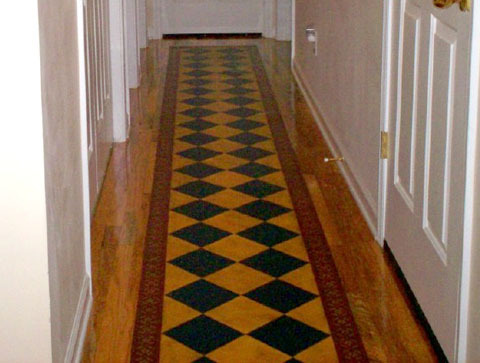 They actually don't walk on them at all, but instead, tiptoe around the edges. It is funny to watch and I have no explanation for their behavior. I have had an atrocious problem with them in the past because they seem to think small area rugs are their litter boxes. I was hoping the floorcloths would solve that problem, and they definitely have. I was so impressed with every aspect of the whole transaction. 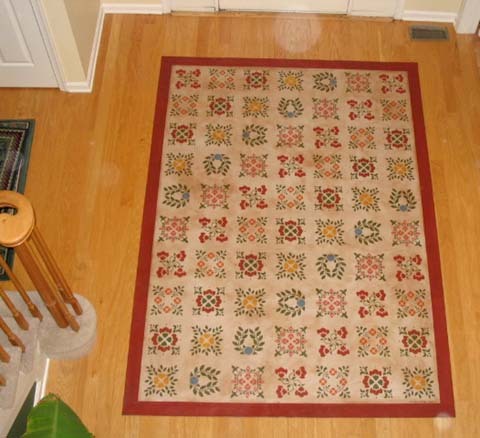 From the time I placed my order, the quick response for a question that I had, the time it took for the floorcloth to arrive, and the quality of it. It is a super site to shop. 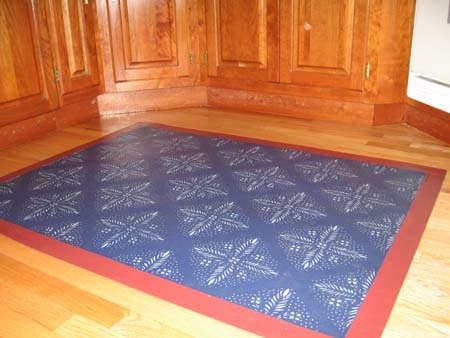 I can't wait for another reason to buy another floorcloth. Thank you so much! 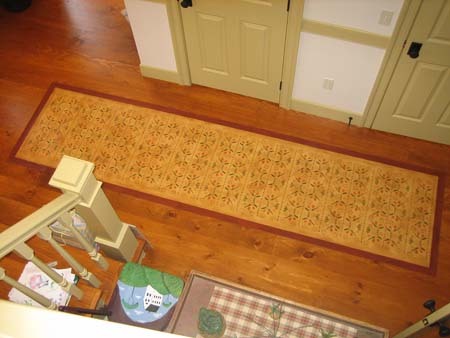 The floorcloth looks absolutely wonderful hanging. 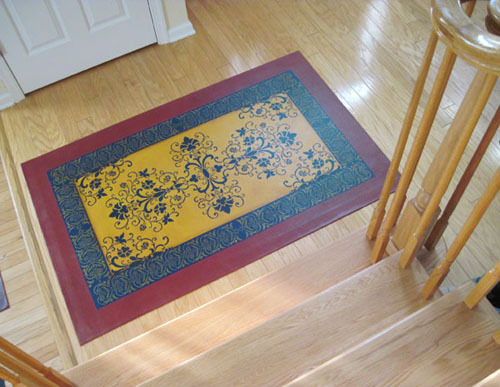 The painted rug is absolutely beautiful! 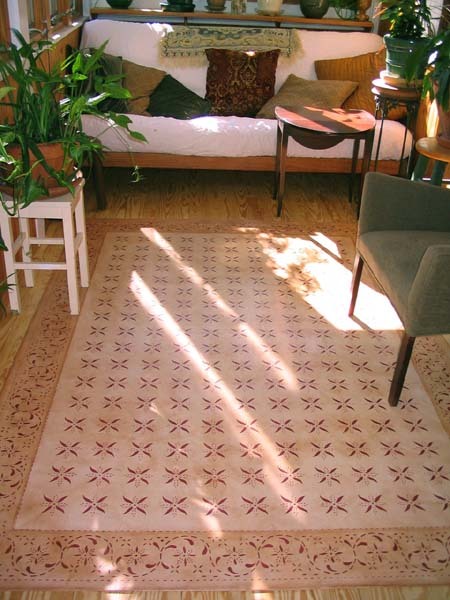 It's a beautiful floorcloth and I am going to refer you to everyone I know. I received my floorcloths today. I just wanted to drop you a note to say how pleased I am with my purchase. I searched several web sites before finding yours. I was delighted, when I found your web site. I am amazed, and overjoyed with my purchase. I will be sure to tell others about Design Village. I very much appreciate your artistry and help you've given me with this purchase. I am very, very, very, very, very, pleased with my purchase! Thank-You again. Thank you Design Village for making my first web shopping experience such a rewarding one. 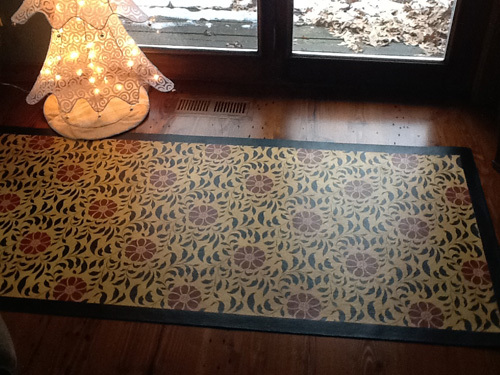 I received the floorcloth on Wednesday and they are beautiful! You wrapped them very well and it arrived here without a scratch. 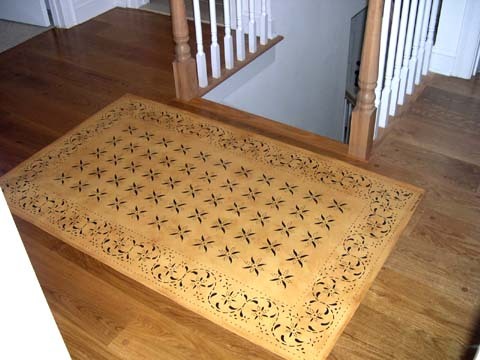 Your floorcloths are really quality piece of art!